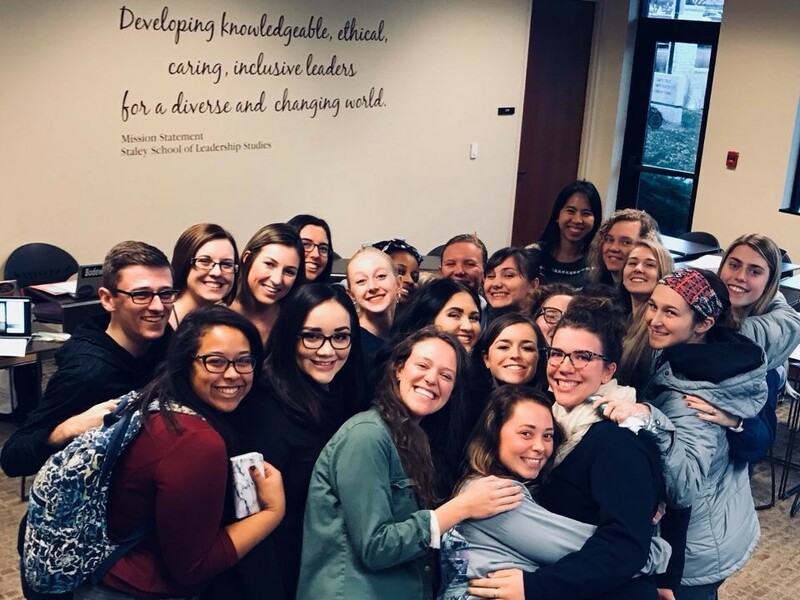 Each fall semester, the Staley School of Leadership Studies extends a unique invitation to junior and senior level students to serve as class leaders and teach alongside faculty for LEAD 212: Introduction to Leadership Concepts. 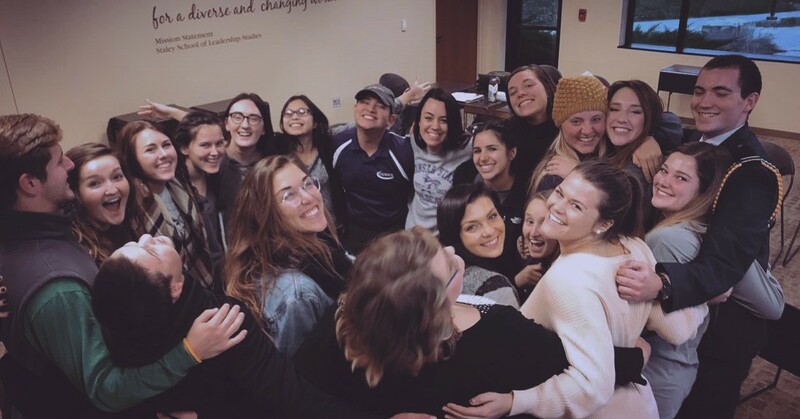 The peer-led learning communities cultivated in this two-hour block over the course of a 15-week semester are highly beneficial to both the class leaders and the students taking the course. Those selected to serve as class leaders help to establish a safe and positive space for learning and self-growth by facilitating small group discussions, leading active-learning exercises, and empowering students in their leadership and academic endeavors. Picture: Class Leaders saying goodbye to one another during the last meeting of their weekly training sessions. Peer-led learning communities have shown to contribute to students’ overall collegiate success. Students have shown to perform better inside the classroom, have a greater sense of community, and grow in leadership efficacy by learning alongside peers. Adam Johnson, a senior in Bakery Science and Management, Food Science and Industry, and a minor in leadership, experienced many dimensions of growth through the experience of serving as a class leader. “This position made me learn of my abilities as an individual and as a facilitator. It gave me so much confidence with my everyday life. Caring for others is an extremely important part of being human, and this role gave me the platform to do so, not only for my students, but for myself. I’ve learned so much from them and I loved this opportunity,” said Johnson. Emily Polston, a senior in Gender, Women, and Sexuality Studies with a minor in nonprofit leadership, found that serving as a class leader allowed her to help educate students about the importance of engaging in difficult conversations and using that to bring about productivity and change through dialogue and locating common understanding. “The most profound learning that occurred for me during my time as a class leader involved interacting with differences. The students that I was able to interact with in my learning community allowed me to continue my personal growth alongside theirs and it was such an incredible experience,” said Polston. Applications are due by noon on Friday, February 9 and will be submitted electronically. For any questions, please contact Tamara Bauer at tamara@ksu.edu. We look forward to receiving your application!